Wishing that the Bank for International Settlements (BIS) had issued its annual report 2009 a day earlier - when Vienna drowned in torrential rain - I nevertheless attempt to provide readers with an executive summary that the central bank of central banks has omitted in its version. This leads me to the first conclusion that world finance must have become really complicated when not even several dozen BIS economists with months of preparation time can sum up 250 pages of data and events. Please recline your chair and hang around as this annual report from what should be the highest-ranking group in the know unwittingly delivers ironies rat-tat-tat like an AK-47 in the loose hands of a kid soldier in one of these African countries we only know about because their soil holds rare elements needed to make your iPhone. Starting with a stark notice that even the BIS profit declined from SDR 544.7 million to SDR 446.1 million (FRN660 million) YOY we are told that in a world once dominated by the Markowitz' model of portfolio diversification not even the BIS with a portfolio supposedly filled with assets (or just papers?) from all over the world was able to outperform markets. If you read some sarcasm into this, you are right. After all there are enough bloggers who had warned about the current global crisis as many as 5 years early. Check my blogroll in the sidebar. Sarcasm is the mildest form I can call my lines following below. Or was it just plain ignorance of warning voices that lead the authors of this annual report to start off with a question? How could this happen? No one thought that the financial system could collapse. Maybe they had better looked at the irresponsible monetary policy of the Federal Reserve in this millennium that did not create a society of house owners but a universe of debtors who have sunk below the water line called negative equity. And how about reading other stuff than the Bubble Street Journal (WSJ) or other lamestream media? Simple "Go ogle" searches on various topics and reading their very own statistics could have alerted them to such fundamental changes like the USA morphing from the biggest creditor (until Nixon closed the gold window) to the biggest debtor in 3 decades that managed to stuff its unbacked FRNs down the throat of more or less all other nations under the disguise that these unbacked greenbacks were a "reserve currency." As I am already so enraged I refer you to pages 2 to 10 of Alice in Wonderland, sorry, I meant the BIS annual report. I have only one explanation for their explanations: One does not bite the hand that feeds one. I bow my head in honour of former World Bank chief economist Joseph Stiglitz who overcame this rule in order to set the record straight with his books. The same applies to former economic hitman John Perkins who tells in 2 books how he was contracted to draw unrealistic growth scenarios for developing countries, to be used by US banks and companies as a reason to indebt such nations while reimporting the loans by handing out contracts to US firms, greasing the local elite's hands on the way. You don't really have to read these 9 pages if you have been following this blog on a post-by-post basis since April 2005. Commentators cautioned about the deterioration of credit standards, especially in the issuance of mortgages. And they warned about the risks that come with rapid financial innovation. Do they allude to the blogosphere or did I just drink too much vin du pays this sunny afternoon? Monetary policymakers’ only available instrument was the short-term interest rate, and there was a broad consensus that this tool would be ineffective against the alleged threat. How many SDRs does one get paid for such enlightenment - after the world's investors were pared of half their savings in 2008, according to Blackstone? As the BIS writers begin mind games whether more regulation - currently a hot issue in the EU especially stressed by German chancellor Angela Merkel - could have helped avoid the mess we currently live in, I humbly remind everybody that in a truly free market it is every investors own occupation to do his due diligence on prospected investments. There has never been a free lunch. Before you get tired; the BIS is good at drawing tables of events that truly simplify recollecting what lead to the biggest financial/economic crisis in mankind's written history. If you did not replicate Robinson Crusoe's life on an isolated island you can also skip pages 16 and 17. But the following timeline of key events from 2007 to mid 2009 is a useful guide for future historians. 9 August Problems in mortgage and credit markets spill over into interbank money markets when issuers of asset-backed commercial paper encounter problems rolling over outstanding volumes, and large investment funds freeze redemptions, citing an inability to value their holdings. 12 December Central banks from five major currency areas announce coordinated measures designed to address pressures in short-term funding markets, including the establishment of US dollar swap lines. 16 March JPMorgan Chase agrees to purchase Bear Stearns in a transaction facilitated by the US authorities. 4 June Moody’s and Standard & Poor’s take negative rating actions on monoline insurers MBIA and Ambac, reigniting fears about valuation losses on securities insured by these companies. 13 July The US authorities announce plans for backstop measures supporting two US mortgage finance agencies (Fannie Mae and Freddie Mac), including purchases of agency stock. 15 July The US Securities and Exchange Commission (SEC) issues an order restricting “naked short selling”. 7 September Fannie Mae and Freddie Mac are taken into government conservatorship. 15 September Lehman Brothers Holdings Inc files for Chapter 11 bankruptcy protection. 16 September Reserve Primary, a large US money market fund, “breaks the buck”, triggering large volumes of fund redemptions; the US government steps in to support insurance company AIG (and is forced to repeatedly increase and restructure that rescue package over the following months). 18 September Coordinated central bank measures address the squeeze in US dollar funding with $160 billion in new or expanded swap lines; the UK authorities prohibit short selling of financial shares. 19 September The US Treasury announces a temporary guarantee of money market funds; the SEC announces a ban on short sales in financial shares; early details emerge of a $700 billion US Treasury proposal to remove troubled assets from bank balance sheets (the Troubled Asset Relief Program, TARP). 25 September The authorities take control of Washington Mutual, the largest US thrift institution, with some $300 billion in assets. 29 September UK mortgage lender Bradford & Bingley is nationalised; banking and insurance company Fortis receives a capital injection from three European governments; German commercial property lender Hypo Real Estate secures a government-facilitated credit line; troubled US bank Wachovia is taken over; the proposed TARP is rejected by the US House of Representatives. 30 September Financial group Dexia receives a government capital injection; the Irish government announces a guarantee safeguarding all deposits, covered bonds and senior and subordinated debt of six Irish banks; other governments take similar initiatives over the following weeks. 3 October The US Congress approves the revised TARP plan. 8 October Major central banks undertake a coordinated round of policy rate cuts; the UK authorities announce a comprehensive support package, including capital injections for UK-incorporated banks. 13 October Major central banks jointly announce the provision of unlimited amounts of US dollar funds to ease tensions in money markets; euro area governments pledge system-wide bank recapitalisations; reports say that the US Treasury plans to invest $125 billion to buy stakes in nine major banks. 28 October Hungary secures a $25 billion support package from the IMF and other multilateral institutions aimed at stemming growing capital outflows and easing related currency pressures. 29 October To counter the protracted global squeeze in US dollar funding, the US Federal Reserve agrees swap lines with the monetary authorities in Brazil, Korea, Mexico and Singapore. 15 November The G20 countries pledge joint efforts to enhance cooperation, restore global growth and reform the world’s financial systems. 25 November The US Federal Reserve creates a $200 billion facility to extend loans against securitisations backed by consumer and small business loans; in addition, it allots up to $500 billion for purchases of bonds and mortgage-backed securities issued by US housing agencies. 16 January The Irish authorities seize control of Anglo Irish Bank; replicating an approach taken in the case of Citigroup in November, the US authorities agree to support Bank of America through a preferred equity stake and guarantees for a pool of troubled assets. 19 January As part of a broad-based financial rescue package, the UK authorities increase their existing stake in Royal Bank of Scotland. Similar measures by other national authorities follow over the next few days. 10 February The US authorities present plans for new comprehensive measures in support of the financial sector, including a Public-Private Investment Program (PPIP) of up to $1 trillion to purchase troubled assets. 10 February G7 Finance Ministers and central bank Governors reaffirm their commitment to use the full range of policy tools to support growth and employment and strengthen the financial sector. 5 March The Bank of England launches a programme, worth about $100 billion, aimed at outright purchases of private sector assets and government bonds over a three-month period. 18 March The US Federal Reserve announces plans for purchases of up to $300 billion of longer-term Treasury securities over a period of six months and increases the maximum amounts for planned purchases of US agency-related securities. 23 March The US Treasury provides details on the PPIP proposed in February. 2 April The communiqué issued at the G20 summit pledges joint efforts by governments to restore confidence and growth, including measures to strengthen the financial system. 6 April The US Federal Open Market Committee authorises new temporary reciprocal foreign currency liquidity swap lines with the Bank of England, ECB, Bank of Japan and Swiss National Bank. 24 April The US Federal Reserve releases details on the stress tests conducted to assess the financial soundness of the 19 largest US financial institutions, declaring that most banks currently have capital levels well in excess of the amount required for them to remain well capitalised. 7 May The ECB’s Governing Council decides in principle that the Eurosystem will purchase euro-denominated covered bonds; the US authorities publish the results of their stress tests and identify 10 banks with an overall capital shortfall of $75 billion, to be covered chiefly through additions to common equity. Sources: Bank of England; Federal Reserve Board; Bloomberg; Financial Times; The Wall Street Journal. If you need more detail, read a longer version of these key events thru page 36, multi-colored graphics included. a full-fledged crisis that reached historic proportions. Over the medium term, the health of financial firms will depend on the interplay between their response to losses and the dynamics of the macroeconomy. The feedbacks between the two become particularly strong when the capital cushions of financial firms are depleted. In the first stage of the crisis, capital raised from private investors met the cost of writedowns on securities portfolios. In subsequent stages, private capital had to be supplemented on a large scale by public sector resources to address mounting losses on institutions’ loan books driven by rapidly deteriorating macroeconomic conditions. The pace and shape of recovery will be critically linked to the ability of financial firms to manage their leverage and capital positions in a challenging environment without unduly restricting the flow of credit to the economy. From a longer-term perspective, the crisis carries important messages for the structure and stability of the financial system. The events of the past two years highlighted how strong the interdependencies between financial system components can become. Market participants and also, arguably, prudential authorities underestimated the complementarities in the roles of different actors along the securitisation chain, the close interlinkages among financial markets and institutions, and the interplay between asset market and funding liquidity. Things get more interesting on page 40 again. 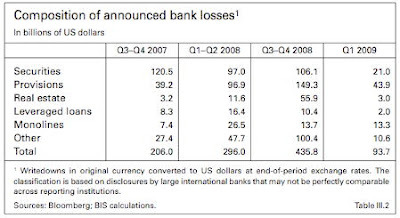 TABLE: So far bank losses seem to have peaked in the 2nd half of 2008. But all unofficial talk that reaches my ears focuses on the BIG whoppers still ahead of us. Especially corporate inter-linkages between banks and insurers may prove to be the major problems as accounting at insurers allows to hide losses much longer than on balance sheets of banks. And don't forget the yet unsolved $700 TRILLION problem of over-the-counter (OTC) derivatives. Search that figure yourself in the BIS report. Last time I checked it was "only" $600 TRILLION. 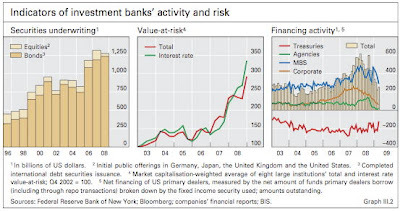 Realizing that this blog post is in imminent danger to resemble the boring (but very readable) layout of the BIS original, here comes some color concerning the investment banking sector, whose limitless greed for ever larger bonuses for its employees is IMHO the root of all the problems we face today. 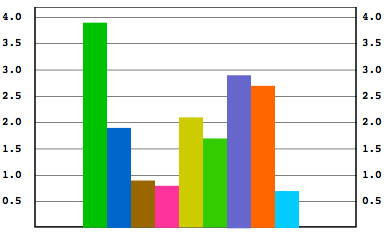 GRAPH: These charts are self-explaining and are in line with bankers bonuses over the past years. I notice that a decline in private risk securitization is now being substituted with more government debt business. As all other underwriting sectors have gone from boom to bust in the hands of pinstriped investment bankers I think this may forebode soon-to-happen disasters with public debt, i.e. the default of sovereigns. Check out this post about the pending risk of defaulting nations/fiat currencies. Sorry for having water boarded you with too much black ink for the past couple of screens. You don't need to read page 48 and onwards to find out that 2008 was the year where the guys in front of an array of Bloomberg screens literally jumped out of the window together with most markets they had been betting on in the years before. 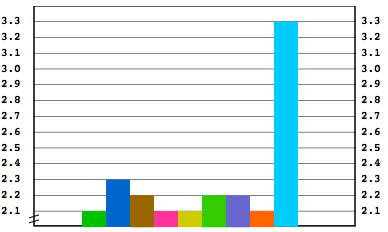 GRAPH: No need to say much here. 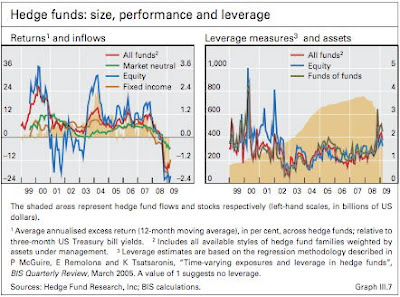 Hedge funds were only riding the wave of markets and disappeared at the same velocity with which the markets of their choice went down. To be fair: Policy interventions limiting trading the short side did not leave them much room for survival in what turned out to be one of the worst years for all kinds of markets. The last decade was not only marked by leveraging equity to the max (most institutions went down or were bailed out once leverage exceeded a level of 30, meaning banks, funds and all other players with access to easy money (thank you Alan Greenspan, thank you Jean-Claude Trichet, thank you Ben Bernanke) were playing with 30 times as much money as they actually had in the till. As if turning the better part into debt slaves by pushing mortgages on more or less everybody who could make it to a bank's office unaided was not enough banks were looking for still more business (and bonuses!) Saturated home markets left them only one choice: Expanding into new territories, kind of a financial recolonization of formerly dependent territories. 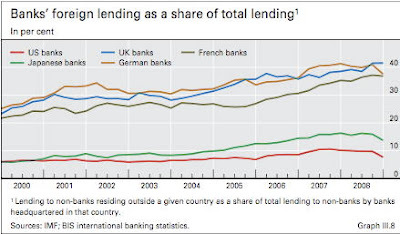 GRAPH: Having grazed off domestic markets, engulfing them in the highest debt levels of history, banks set the sail and started lending all over the world. Of course it is always easy to have the winnining lottery numbers on a Monday; but how the hell is it possible that a generation of whiz kids excelling in constructing sophisticated Excel sheets completely missed out on the unbending fact that growth has its limitations and every excess ends in a mutual cannibalization of market share? 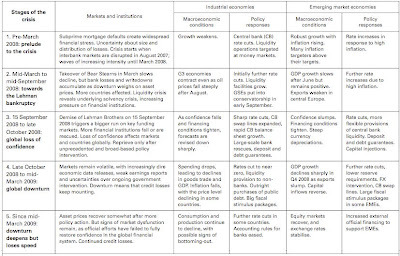 Becoming a little tired to reprint the BIS explanations about the obvious mega-problems in the financial sector one is happy that after 55 pages the BIS begins to focus on what matters most: Financial crashes have always been the precursor of extended economic downturns. Think South Sea Bubble, think France before the revolution in 1789, think Vienna stock exchange in the 70s of the 19th century (then the biggest stock market in the world) and then again in the late 1980s after Jim Rogers kissed it awake from a century long slumber. GRAPH: The real economy followed the downturn in the financial sector with a delay of about one year, proving again an old market rule that stock markets discount the future at a range between 12 and 18 months. I absolutely disagree with this charts low showings of inflation. Inflation indexes are governments tools to keep the wages of public employees and the pensions of retirees as low as possible. This is not a science but simply a sophisticated way of lying in the face of the public. The global financial crisis has led to an unprecedented recession accentuated by rapid declines in trade volumes, large employment cuts and a massive loss of confidence. How deep and prolonged the downturn will be is uncertain. In the industrial countries, there are some signs that the rapid pace of decline in spending witnessed since the fourth quarter of 2008 has started to ease. But a strong, sustained recovery in those countries could be difficult given attempts by households and financial firms to repair their balance sheets. Nevertheless, substantial fiscal stimulus and exceptional monetary easing in many countries should help bring the recent contraction to an end. The policymakers’ task in the near term will be to ensure a sustained recovery. In the medium term, however, it will be to ensure that policies are adjusted sufficiently to maintain the stability of long-term inflation expectations. We have no choice but to take up the challenge of first repairing and then reforming the international financial system, all the while cushioning the impact of the crisis on individuals’ ability to live productive lives. Efforts so far have fully engaged fiscal, monetary and prudential and regulatory authorities for nearly two years. The public resources devoted to economic stimulus and financial rescue have been staggering, approaching 5% of world GDP – more than anyone would have imagined even a year ago. Recovery will come at some point, but there are major risks. First and foremost, policies must aid adjustment, not hinder it. That means moving away from leverage-led growth in industrial economies and export-led growth in emerging market economies. It means repairing the financial system quickly, persevering until the job of restructuring is complete. It means putting policy on a sustainable path by reducing spending and raising taxes as soon as stable growth returns. And it means the exit of central banks from the intermediation business as soon as financial institutions settle on their new business models and financial markets resume normal operations. early stage of development. But the suggestions made here and elsewhere are a start. The work will have to be coordinated internationally. In particular, institutions with expertise in the field – including the Basel-based standard-setting committees and the Financial Stability Board – will need to play a leading role in making such a framework operational. This is going to be a long and complex task, but we have no choice. It has to be done. As in most of my past 600+ posts I disagree with this official attitude that has landedus where we are. It would be maybe of help if all insiders REALLY read David Ricardo and Adam Smith and then follow these centuries old guide lines for free markets. My two cents can be found here and will be extended in the future. Having had very serious thoughts about the gargantuan problems of tiny Austria's banking sector stemming from overly euphoric attempts to financially recolonize Austria's long gone emporium since the end of 2007 bits and pieces of information begin to confirm this blogger's suspicions that Austria will be really hard hit. Resisting attempts to blog more on the matter because of possible libel suits I now can come up with more details thanks to Zerohedge blogs detailed publications of documents issued by Raiffeisen Zentralbank group. Here we go with a story that could not only happen in Austria but in every country with a small banking industry where everybody knows everybody and compliance regulations are only valid during sparse official business hours from 8 AM to 3 PM. Zerohedge, a shooting star in the global blogosphere with millions of hits, first raised my attention last week when it published the prospectus for an exchange offer where RZB group offered to exchange its "€500 million non-cumulative subordinated perpetual callable step-up fixed to floating rate capital notes" - in short hand unsecured crap - against some other unsecured crap called "non-cumulative subordinated perpetual callable fixed to floating rate capital notes" at 55 cents on the Euro. This 45% haircut was sexed up with a 15% coupon (coupon of old notes was 5,69%), but when one reads the fine print it more sounded like a weak promise as the fine print says RZB group only has to pay that high coupon if it has enough resources to do so. OMG, why don't we go to the horse races right away? The new notes were to be issued by RZB Finance (Jersey) IV limited, which is a 100% indirectly owned subsidiary of Raiffeisen Zentralbank AG (RZB) via Raiffeisen Malta Bank, also not exactly a plush bank with €2,000 paid-up capital. A perpetual note is an investment vehicle that has never to be redeemed by the issuer and therefore can only be resold in secondary markets - if there are bids for it. RZB Jersey IV Ltd. has a paid up share capital of €2,000 and is 100% owned by Raiffeisen Malta bank, which also negatively stars with a paid-up share capital of €2,000. RZB Jersey's sole business is to raise hybrid capital for its parent RZB. Read all the details in the prospectus over at Zerohedge. Both companies losses in a total default of the new issue "worth" €275 million would be limited to these €4,000 as much as I understand the complex web of finances without money. So much about the recent past of this issue which had been made public on June 18. Find all the details of the proposed exchange offer over at Tyler Durden's (pseudonym) Zerohedge blog. From here the story gets really hairy. RZB issued a release on Monday 29, saying that it withdrew the offer for the exchange of the old into new "capital" (haha) notes. Having stored this release on my computer I first want to offer Zerohedge's suspicions why the issue was withdrawn. rating agency getting back to the bank that this would be treated as a distressed exchange (as Zero Hedge speculated), putting the company into an Event of Default. For more information about Austria's big role in the demise of Central Eastern Europe financed with the money of depositors at Austrian banks click the label "Austria" below to find more information and background about the possibility that Austria, not long ago considered the 6th richest country in the world, is in a good position to be the first Eurozone member that has to default. For more background, why every Austrian from baby to octogenarian, may be liable for up to €19,600 per capita thanks to bankers who saw only bonuses and nothing else - like maybe responsibility - read this post. NOTE: This blogger will treat all material documents sent to the email address to be found at my profile page with absolute discretion. Preparing this rant about the widening milkyway between Eurozone economic growth and Euro production in the ECB and its printing presses spread evenly amongst Euro members proves one more time that the absoluteness of financial math and official figures are 2 pairs of shoes. 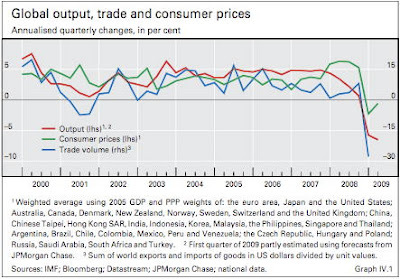 Calculating GDP growth in the so called single market begins with problems of the data source. Harmonization at even the most important levels like data integrity is a goal still to be attained, comparing the EU Commissions data with those of Eurostat, the EU's official statistical office. I would have loved to provide readers with the absolute difference between these two official figures in nominal Euro figures (certainly many many billions,) but such are not available. Browsing Eurostat's and the EU commission's websites does not yield this information. Based on continuously changing consumer baskets in all Euro member countries I am reminded of Winston Churchill's quote that he only believed statistics he had falsified himself. Read more on the issue of juggling inflation figures in this earlier post. Although it deals mostly with US inflation figures you should get an idea of the manifold tricks invented to hide true inflation. My anecdotal evidence stemming from criss-crossing the old world concludes that prices have effectively doubled in the last 10 years. This is a crass disparity to Eurostat's official figures. GRAPH: Annual Eurozone Inflation according to Eurostat from 2000 to 2008. Chart courtesy of Eurostat. Be it Germany where I paid €3,40 for a coffee in Berlin, about double of what it was in the hailed times of the ultra-hard Deutschmark, the Netherlands, where a single fare ticket for the Metro in Rotterdam is a whopping €3,50, or Venice/Italy where a single fare with the public vaporetti - boats - has exploded from 80 Euro cents to €6,50 since the introduction of the common currency let me conclude that the real ascent of prices is closer to 7% annually since the formation of the Eurozone. In my home country Austria gastronomy prices have been going through the roof. A simple lunch menu on Vienna's Naschmarkt where office clerks share tables with guys with ties has shot from an average of €4,35 in 2000 to €8,80 nowadays further elevates my skepticism about the true reflection of consumer prices in Eurostats HICP (Harmonised Index of Consumer Prices) figures. Not that inflation would be a phenomenon limited to Euro members. An average lunch in the city centre of Bratislava/Slovakia, the youngest Euro member, has doubled from €5 to €10 in the last 10 years. Seeing the upper echelons of the ECB jumping with joy about recent declines in HICP figures will be a short-lived spectacle. Italian ECB governing council member Lorenzo Bini-Smaghi told a conference on June 24 that there is a lively European debate whether we have to fear deflation or inflation more. The debate between those who consider that inflation represents the main risk for advanced economies over the next few years and those who instead believe that deflation is the most immediate threat, has polarised, especially in the United States. It has also had an interesting echo here in Europe. Both concerns are legitimate. To some extent, the fact that informed observers can maintain both views simultaneously can be seen as a sign that monetary policy is managing to walk the fine line between the two risks. The debate neatly encapsulates the trade-off currently facing policy-makers. They have to choose between short-term adjustments to strong recessionary forces and long-term macroeconomic stability. A key challenge is how to calibrate the policy response in the face of these forces: too timid a reaction may be costly in the near term, but an overreaction may sow the seeds of the next crisis. I will argue that a policy action that aims to ensure macroeconomic stability in the medium term requires a thorough examination of the risks, in much the same way as a disease calls for a sound diagnosis if it is to be properly treated. They better hurry up with their diagnosis, as this crisis is far from over although my gut feeling tells me we will see a short-lived bounce this fall in economic activity before the whole mess caves in due to unsustainable debt levels on both public and private accounts. Enjoying blogger's freedom of speech I firstly expect significantly more true inflation based on the daily price shocks I experience when shopping or paying for public services which should be covered by taxes already. Double-charging has become the new norm in the leading debtor nations of the world, 9 of the first 10 of them being Eurozone countries. 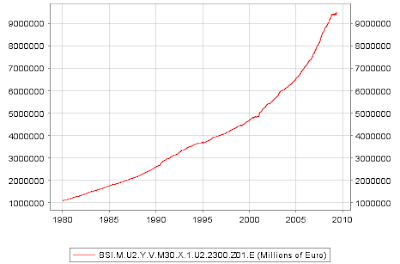 Secondly I allow myself to remind the money printers in the ECB that no saver would ever fear deflation. Or would you mind if your weekly grocery bill would be lower? The ECB's self-pride is based on clay feet though. A slowdown of M3 growth while the economy contracts still means there is more fiat money produced compared to the declining purchases of goods and services with these funny colorful papers that are only backed by the belief they will buy the same amount of goods and services in the future as they did in the past. Not only nominal but also the relative change of M3 - hovering above the ECB's reference rate (whatever that means) shows that we are still experiencing monetary inflation at its best. 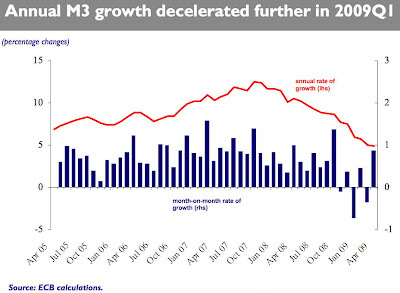 GRAPH: Don't get confused: Month-on-Month change of M3 is still way to high in order to return to the ECB's meaningless reference rate of 4.5% annual M3 growth, a growth rate it has never reached since the inception of the Euro. 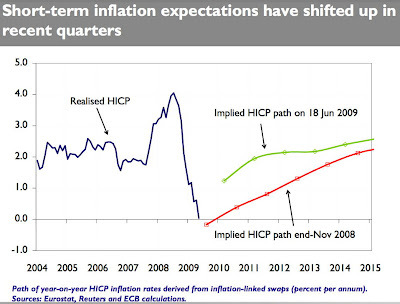 Chart courtesy ECB. Click for larger image. Another way to see that the ECB will have to face runaway inflation is the comparison of weak GDP growth since 2000 and the balance sheet of the ECB. Repeating above mentioned meekly economic growth of 18,98% or 19,64% (depending on the data source) lags far behind the 162% growth of the ECB's balance sheet between January 2000 and end of 2008. In absolute figures the balance sheet grew from €792 billion to €2,072 billion. This is a lot more money sloshing around in comparison to GDP growth. While these additional €1.3 trillion (on Tuesday it will be €1.75 trillion) are now kept within the ailing banking sector who ran agog creating derivatives, thereby exploding leverage to dimensions never seen before in history, this money has to trickle through into the contracting economy, pushing up nominal and real prices at one point. After all, for every loser there is a winner who will try to maximize his gains again. 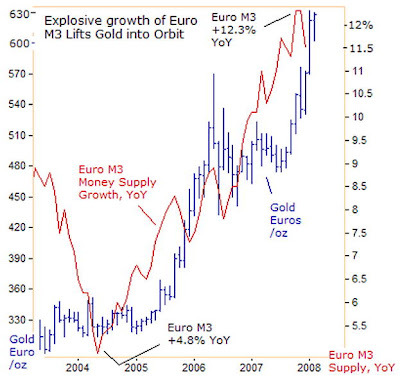 Although the next chart from Gary Dorsch is a bit outdated, stemming from February 2008, it again proves the point that gold is a most reliable canary in the coal mine of monetary inflation. GRAPH: Observing since a while that gold only gyrates against Federal Reserve Notes but remains more or less steady priced in Euros this year is another indication that the dollar's days will come to an end soon. Chart courtesy Gary Dorsch via MarketOracle. I sign off with John Pierpoint Morgan's historical quote when asked by congress in 1907 what money actually is. "Gold is money. Everything else is credit." And finally I like to promote this phrase, brought to my attention by learntotradefutures.com publisher Duncan Robertson. Silver is the Money of merchants. Shocked by the fact that lamestream media and Twitter are all about Michael Jackson's death from what appears to be a drug overdose, I enjoy being the spoiler for a world that seemingly does not know how to set its priorities anymore. While 33 of the 42 commercial media I regularly read headline with Jacko, it is Chinese media that published the truly important news of the day. Here's the executive version of Chinese economic news picked from the English language People's Daily Online. China takes public ownership as the main body and the other (issue) is to adhere to the common growth of economy belonging to diverse forms of ownership. The People's Bank of China (PBoC) will stick to an appropriately easy monetary policy but will ensure reasonable growth in money and credit, the central bank said yesterday. New credit in the first half of 2009 will definitely surpass 6 trillion yuan, and some experts even predict the figure to be up to 6.5 trillion yuan. This means that total credit in the first half of this year will be more than the total amount invested in any year since China was founded. China should buy more gold because the dollar is poised for a fall and the metal is needed to support the greater international role envisaged for the yuan, a senior researcher with the ruling Communist Party said. You can now go back to watch CNN's US propaganda broadcast and remain in the "don't worry, be happy" camp which still has a solid majority in the Western world. Or would you prefer to gather a little more intel on the next #1 power in the world? Then read on. Taking public ownership as the mainstay is a fundamental principle of socialism. In a socialist country like China, where people have become masters of their own destiny, it is imperative to keep public ownership of means of production as a basis of the socialist economic system. So, adherence to public ownership as the main body is of vital importance in giving play to the superiority of the nation's socialist system, increasing the nation's economic strength and promoting social harmony in the country. Pointing out, that 26 of the 500 largest companies in the world as of 2008 are state-controlled Chinese corporations, the most populous nation on earth insists that it is not so much about ownership-ideology but about keeping up a harmonious people. In a nutshell, it is imperative and essential to consolidate and develop the public ownership economy, to encourage, support and guide the growth of the non-public sector economy, and to maintain the right to equal access of property resources, so that a brand-new situation will emerge, in which all economic sectors will "vie with each other" on an equal footing so as to spur their economic activity for mutual advancement. "The top priority at the moment is to stop the explosive growth in lending at the end of the month and quarter," China Banking Regulatory Commission said in a recent notice to lenders, pointing to the phenomena of banks racing to offer loans before June to meet their half-year lending targets. The Eastern dragon so far performs much better than any recession-stricken nation in the West, where money supply has rocketed to potentially fatal (hyper inflationary) levels. Covering bullet point #3 in their own words, China plays its monetary muscle. People's Bank of China Monetary Policy Committee recently held a regular meeting on the second quarter of 2009. The conference studies the orientation of monetary policy and measures for the coming future, concluding that we need to implement moderately easy monetary policy and maintain the continuity and stability of policies to guide a reasonable growth in monetary credit. It is learned that in the first five months, RMB loans increased by 5.84 trillion yuan. June figures have not yet been released, but according to past experience, new credit in the first half of 2009 will definitely surpass 6 trillion yuan, and some experts even predict the figure to be up to 6.5 trillion yuan. This means that total credit in the first half of this year will be more than the total amount invested in any year since China was founded. Show me a Western country that could shell out a trillion Euros/dollars from its full pockets! There is no such thing. All stimulus packages Western politicians promise are only backed by the hope of future tax payments. China can dive through a recession on its savings whereas the so called first world has nothing else to show than debts that are enough of a burden for the two next generations. Wouldn't we all love to have the same economic discussion as the Chinese where economists argue whether the economy has bottomed out at a growth rate of 6.1% in Q1 2008 or whether one should be skeptical about a possible GDP growth rate of 9%? Diving into recent history (i.e. this blog's archive) China can actually see the global downturn as a benefit that helps keeping the economy from overheating. BTW, why are we actually concerned with "overheating" economies? Don't we all want to become rich by tomorrow? But I won't digress, this is an entirely different discussion best to be had over a bottle of good plum wine. Let's better proceed to bullet point #4: China's growing role in forex markets. Reuters staffers Zhou Xin and Alan Wheatley direct my attention to the fact that China sees a much bigger role of gold in global currency policy after surprising the world with the fact that it had domestically purchased gold and now sits on a hoard of 1,054 tonnes after publishing a figure of 660 tonnes since 2003. China should buy more gold because the dollar is poised for a fall and the metal is needed to support the greater international role envisaged for the yuan, a senior researcher with the ruling Communist Party said on Thursday. Li Lianzhong, who heads the economic department of the party's policy research office, said China should use more of its $1.95 trillion in foreign exchange reserves to buy energy and natural resource assets. Speaking at a foreign exchange and gold forum, Li also said that buying land in the United States was a better option for China than buying U.S. Treasury securities. "Should we buy gold or U.S. Treasuries?" Li asked. "The U.S. is printing dollars on a massive scale, and in view of that trend, according to the laws of economics, there is no doubt that the dollar will fall. So gold should be a better choice." Following the nuances of Chinese official-speak it is clear that China sees itself superior in monetary policy but is left with a problem it shares with all creditors in the world: Its forex reserve stash consists mainly of unbacked Federal Reserve Notes (FRNs), a fiat currency backed by nothing else than the belief it will buy you the same amount of goods and services in the future as it did in the past. China takes appropriate steps at its own rhythm to secure a bigger role for the Yuan in the future. Looking at the Yuan's slow revaluation so far China has made good on its promises to the bankrupt USA. Li cited the high share of gold in the foreign exchange reserves of the United States, Italy, Germany, and France to argue that China's gold holdings, which account for about 1.6 percent of its reserves, are too small. China does not disclose the composition of its currency reserves, but bankers assume around 70 percent is held in dollar assets. China is the largest single holder of U.S. Treasuries, with $763.5 billion at the end of April, according to U.S. Treasury data. Analysts say this data set understates the true number as it does not capture paper bought through dealers in London or elsewhere. Li said a second reason for buying more gold would be in anticipation of the yuan one day becoming a reserve currency. The yuan is not convertible on the capital account, meaning it cannot be freely traded for other currencies for financial transactions that are not related to trade. This rules out the yuan's use as an international reserve currency, for central banks would not be able to convert it quickly if necessary. But in a very preliminary step toward that goal, China is paving the way for greater use of the yuan beyond its borders. The People's Bank of China has arranged currency swap deals with six countries since December totalling 650 billion yuan ($95 billion) so that trade and investment with China can be conducted in yuan, not dollars. And China will soon allow selected firms in the southern province of Guangdong that trade with Hong Kong to settle their transactions in yuan, or renminbi. "If the yuan should go international or become a reserve currency, China needs more gold to back that," Li said. One must not forget that China's political state supports long term strategies for which Western leaders who want to get reelected every 4 years have no leeway. When the yuan does become an international currency, which Li acknowledged was a long way off, he said the composition of the SDR should be reformed to include the Chinese currency. Ideally, in the long term, the SDR would be made up of the dollar, euro, sterling, yen, and yuan, each with a weighting of 20 percent, Li said. The four currencies in the SDR, which must be convertible, are those issued by fund members with the largest share of global trade. The weights assigned by the IMF are based on the value of exports and the amount of reserves denominated in those currencies. The composition of the basket is reviewed every five years. the next review is due in 2010. Rest assured that the dragon will blow some hot air down the Western world's spine in the run-up to this review. This rumour could become TNT for the USA. Newsletter publisher Harry Schultz who correctly forecast the 2008 stock tsunami and outperformed the market more or less as long as he invests, comes up with truly hot stuff. "Some U.S. embassies worldwide are being advised to purchase massive amounts of local currencies; enough to last them a year. Some embassies are being sent enormous amounts of U.S. cash to purchase currencies from those governments, quietly. But not pound sterling. Inside the State Dept., there is a sense of sadness and foreboding that 'something' is about to happen ... within 180 days, but could be 120-150 days." "Another FDR-style 'bank holiday' of indefinite length, perhaps soon, to let the insiders sort out the bank mess, which (despite their rosy propaganda campaign) is getting more out of their control every day. Insiders want to impose new bank rules. Widespread nationalization could result, already underway. It could also lead to a formal U.S. dollar devaluation, as FDR did by revaluing gold (and then confiscating it)." This is one more rumor adding to my suspicions something big is going to happen. An imperium in decline will play all dirty tricks in order to stay afloat. There are no green shoots to be seen for several years, as explained in my 600+ earlier posts. We are in for a K-winter (Kondratieff). Was the swine flu just a test run for a deadlier pandemic? Or will the US default by waging WW3? Section 25C of the Federal Reserve Act (adapted in 1994) explicitly says that the USA does not have to repay debts to a country if the two countries are engaged in a war. Read more on the US external debt in this earlier post "The US debt balloon - a simple explanation for non-economists." If your small-time loan you need for your kid's bracelets is denied by your bank's customer representative, you have every right to go berserk. The European Central Bank (ECB) came up with one of their ominous "innovations" on Wednesday that essentially is nothing else than a new form to print still more money. With a record tender of €442,000,000,000 (that is €442 billion) the ECB has showered Eurozone banks with €1,437 for every Eurozone citizen in its first tender with a 371 day maturity, accepting all bids at the fixed official rate of 1%. BTW how much does your bank charge you for an overdraft? I presume it is closer to 10%, leaving the banks with a hefty profit that makes me understand why even the bible discusses usury. These figures show that ECB president Jean-Claude Trichet and all the governors on the ECB's council have been publicly denying what cannot be overseen anymore: The Eurozone system is broken beyond repair. Check these posts where the (expletive) central bank(rupt)ers have told us since the onset of the crisis in August 2007 that all is well and contained. My god, I yearn for the good old times of the subprime crisis when I could enrage myself about lousy €50 billion quick tenders. Check my archives since August 2007 for more chronology of the subprime crisis mutating into a full blown global banking crisis. With the latest "innovations" in the process of digitizing new fiat money the ECB basically does the same what it has done since the onset of the crisis: Creating more new money, only with longer maturities and less regard for the quality of collateral, whose rules it softened last year. Only yesterday Austria's central bank governor Ewald Nowotny had told a champagne drinking crowd at the annual self-celebration of Austrian bankers that the worst is yet to come; an abrupt U-turn after he developed a 100% wrong track record since he took office last year. The inofficial sounds that reach my ears fully agree with this bleak outlook. The Eurozone's cross border banks had gone completely mad in Eastern Europe. Or what would you call €800,000 condos in Sofia/Bulgaria where the average net monthly income is €300? Bulgarian tax authorities are now checking all Bentley owners - and there are lots of them - from where their cash stems. Small hint: from foreign banks hallucinating when they pushed loans onto people, charging them 16% interest and more. Lets not forget that this will blow up the ECB's balance sheet next week, propelling it again over the €2 TRILLION mark. All this happens at a time when all consumers in the old world have gone into standby mode, deferring everything but the most important items like food when they go out shopping. I notice more and more shops selling luxury items (like balsamico vinegar and Dijon mustard ((the original producer company went bankrupt last year)) that now glue ads into their windows, offering discounts between 10% and 50%. Being used to bazar methods from my many years in Asia I can now immediately claim the status of a "regular" customer, getting huge discounts the first time I frequent a store. Euro-zone banks borrowed the one-year funds, the largest amount the central bank has ever dispersed at a single shot, at the ECB's current key rate of 1%. Much of the total likely substituted for amounts banks had been borrowing from the ECB for shorter time periods, so the net stimulus to the economy is less than it appears at first sight. Analysts said the high demand for the funds reflected the problems some banks are still having in funding their businesses. At the same time, it also reflected expectations that the euro zone's economy will start to recover later in the year and that ECB interest rates are unlikely to fall further. ECB policy makers have signaled they are not inclined to cut their key rate -- now at the lowest level in the central bank's 11-year history -- again unless the euro-zone economic outlook darkens substantially. Analysts expect the key rate to hold steady at 1% through year end. The Paris-based Organization for Economic Cooperation and Development said Wednesday in its latest forecasts that the ECB still had scope to cut its key rate further. At the peak of the crisis, banks were using over €1 trillion in short-term funding from the ECB. As fears of a complete meltdown of the financial system have eased, that has fallen to around €618 billion. During the worst of the crisis, banks were forced to live from week to week, always anxious about access to liquidity. In response, the ECB offered money first for three, then six and now 12 months to give banks greater clarity in their operations, hoping the certainty of longer-term funding from the ECB would encourage them to lend again to the real economy. "This should reassure the banks that they have adequate liquidity for the next 12 months," ECB governing council member Lorenzo Bini Smaghi said in a speech to a university in Rome Wednesday. By promising a full allocation of all bids on Wednesday, the ECB has effectively passed responsibility for any easing of policy to the banks themselves, giving complete license to any institution that thinks it can lend the money out profitably into the real economy. "They must pass it along," Mr. Bini Smaghi said. This is exactly the problem that has not been solved in the last 22 months and will also not be solved by creating pan-European watchdogs for the financial industry: Banks are not willing to lend unless you present them with 200% collateral. As always, credit is only around for those who don't really need it. Anybody wagering a bet that Europe will recover within the next 12 months. I'd love to take the other side. Moody's Next Epic Fail: "US Remains a Solid AAA Nation"
While the currently ongoing two-day meeting of the Federal Open Market Committee (FOMC) is probably not only discussing the state of the US economy but also how to maintain the global attraction status of its only product, Federal Reserve Notes (FRNs) in unlimited amounts which they prefer to call the primary global reserve currency, it is difficult not burst into full laughter about rating agency Moody's stance. Moody's Investors Service said on Tuesday that the U.S. government's triple-A credit rating was safe but added that it could be at risk if Washington were unable to bring its public debt back to a downward trajectory. Financial markets have repeatedly been spooked this year by concern that triple-A rated governments such as the United States and Britain could face credit ratings downgrades as they borrow heavily to spend their way out of recession. "The U.S. government triple-A is safe," Pierre Cailleteau, team managing director of Moody's Sovereign Risk Group, said at a media briefing on sovereign credit ratings held in Tokyo. Moody's has a stable outlook on the U.S. rating, which indicates a change is not expected over the next 18 months. I wonder why there are still people around who believe any of the wrong commonplaces rating agencies release to the public while cashing in megabucks from those being rated. A look back in recent financial history should make investors or those who manage the money of investors reconsider their belief into institutions that have failed at all times. Moody's had completely missed the rapid deterioration of Latin American finance in the 1980s after overlooking the US savings & loans crisis at the same time. They were asleep at the wheel when the collapse of the Asian tigers in the early 1990s began and slept during Russia's bankruptcy in 1996, only to awake to see the multi billion failure of Long Term Capital Management in 1998. That must have been such a shock that Moody's was paralyzed during the popping of the Internet bubble in 2000 and Enron's fraudulent bankruptcy a little later. Oh, let's not forget such sovereign risks like Argentina that went bankrupt twice within a decade. It defies any logic that the most indebted country in the world running the biggest triple deficits of all is still considered a AAA risk. If this rating is based on any rationale, we can all go and ask for a quadruple-A. Or do you run bigger deficits, owe more money and outsourced all your earlier sources of income like the USA does? Having to fund two wars in the name of petro-theism while being confronted with an imploding economy that would look so much worse weren't it for the limitless army spending and the growing number of public employees - who will blow up future pension liabilities into the quadrillions - does not exactly look like a strategy that may improve the state of the United States. Having deindustrialized (save for the arms and surveillance industry) what was once the greatest power of the world I wonder what Obama has up his sleeves to turn around the epic disaster he inherited from George W. Bush. So far all we have seen is a backtrack on most changes he promised ahead of the election. The US army will continue to bomb, maim and probably torture people who ask nothing else than to be left alone in peace. An extension of the army engagement in Iraq, more soldiers for Afghanistan and moves to topple Iranian president elect Ahmadi Nejad - nobody complained when Bush stole 2 elections at hair's width, while Nejad repeated his 62% majority - may be a boon to the military-industrial complex but won't pull the US out of its down spiral. As we have arrived in the age where trillions are the new billions - without the financial industry noticing it - the USA looks like every empire in decline: too many armed conflicts, a profligate government overspending and a general downtrend in public education (because this sector is bankrupt too) accompanied by monetary inflation has always ended in disaster. Americans can only console themselves with the fact that all central banks print money at full speed despite the economic contraction. There were possible risks that could lead to a downgrade. "That will happen for two reasons. Either our assumptions in terms of debt reversibility prove to be wrong. That is, in fact the U.S. government is unable to bring public debt back to a downward trajectory," he said. The other reason would be if the United States' ability to raise a large amount of debt at a low cost were to be put at risk, Cailleteau said. "It could be put at risk if the U.S. dollar was severely challenged as the main international reserve currency," he said. But the possibility of the dollar being replaced as the main international reserve currency in the near future was a "pretty remote risk," he added. "I think central banking has learned the dangers of fiat money." Worldwide exploding money supply despite being stuck in a recession that may see a little bounce later this year before we begin to see the signs of a true recession tells me the opposite. By adapting zero interest rate policy central banks have outmaneuvered themselves. The only weapons left are their digital printing presses and the belief of the people that these colourful debt papers will somehow retain their purchasing power. This cannot happen and the Weimar Republic is the example that scares Germans until today. While the official world tries to discard M3 money supply growth as an outdated indicator I point you to this story (CNN online page gone by now) where former Deutsche Bundesbank president Hans Tietmeyer - 15 years ago the second most powerful central banker in the world - is described as a central banker who was "trained in the monetarist school that teaches rapid money supply growth is a sure predictor of inflation and requires a firm policy response." We have not yet seen anything that would somehow resemble the iron grip of the German Bundesbank. It has always been a miracle to me which set of figures the rating agencies apply to arrive at their always too late conclusions. Maybe they publish how they arrive at their ratings in order to be able to follow their school of thoughts and formulas. that inflation should be taken most seriously and that an improvement in this year's budget deficit would be wiped out by permanently higher social spending on an aging population. Oh, and don't forget that "is is critical that we maintain confidence in our currency," Volcker said. I could not agree more despite the current asset deflation that inflation will become the most hated word of 2010. 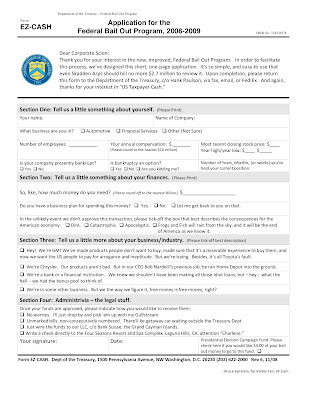 Click the form for a larger image, print it, fill it out and send it to Treasury Secretary Timothy Geithner. Fax a copy to president Barack Obama for quick processing if bailout exceeds $10 billion. As this list of silver companies published in 2007 has become the most-read blog post this year I felt compelled to update it. Compiling a list of silver companies is controversial as there are only very few pure silver plays. The white metal is mostly mined in combination with gold or base metals which can dramatically change the bottom line of silver miners. In some cases the mining of base metals and gold can lead to negative cash costs for every ounce of silver produced. Silver is primarily used in jewellery and the best metallic electric conductor. For more applications for silver check this webpage by preciousmetalinvestment.com. 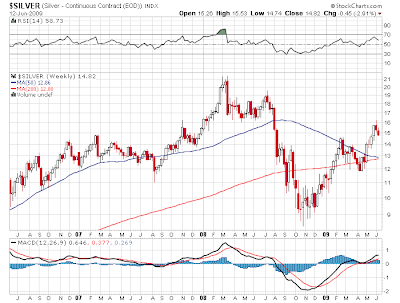 Expecting silver prices to multiply in the next 5 years these companies give extra leverage - if their plans come true. All silver stocks got hammered in 2008 in the biggest crash in the mining sector in the last 80 years. Do your own research as some companies are trading at less than the cash they have in the till. While the IPO train on Wall Street has become a train wreck due to the hesitancy of investment banks when underwriting new issues, junior miners are not dependent on conventional measures to raise capital. They (better) know how to attract investors with a long term horizon directly, as I was able to witness myself when living in Vancouver in 2007. Vancouver stock exchange is the primary market for junior miners for all kinds of resources. The market had had a shady reputation in the 1980s but has cleared up his act by establishing mandatory reporting rules for junior miners. Its most important improvement was the introduction of standards for reporting new metals reserves. GRAPH: Silver is a lot more volatile than gold while physical demand is unprecedented. The Austrian Mint produces silver Philharmonics 24/7 since introducing this bullion coin in 2008. Silver currently trades at a ratio of 1:63 to gold. In the long term this ratio has been closer to 1:15, leaving enormous upside potential for silver that could easily lead to a price around $40 next year. Chart courtesy of stockcharts.com. I consider investments in exploration companies as very risky and build up positions very slowly. But they come with a notable exception to the golden rule that for every percentage point of possible reward there is an equal risk. Quality of management. Check the track record of management in past mining ventures. Management's stake in the company. If they don't sell or even buy more it is usually a good sign. Delays. Are there any delays in realizing the company's ventures ? Cost per ounce. What are the company's cash costs per ounce produced? How much do I pay per ounce when I buy their shares? Institutional shareholders. Which funds own the company, which analysts cover the stock? Proximity to production. Potential gains are higher with explorers in the early stages, but so are the risks. I like companies in the process of finalizing the feasibility study for financing or - at a later stage - companies that are close to production. Political risk. Your due diligence has to include the respective stability of the country where your miner digs the money out of the ground. In respect of the political risk I also shun US based silver miners as there exists a possibility that the government can nationalize virtually any company under the Trading With the Enemy Act, which became law in 1917 during World War I and applies during declared wars, and from 1977's International Emergency Economic Powers Act, which can be applied without declared wars. Read more on this issue on GATA's website. Marc Courtenay has recently penned a story at SeekingAlpha that deals with the possibility of another confiscation of gold and silver and mining shares by the US government. Seeing all the current nationalizations of car makers, banks and the health sector in the USA I don't rule out anything anymore. 24hgold.com my first stop for mining research. Will be soon the most extensive database on resource stocks, currently in beta phase. NOTE: Please email me if I have missed out on one or more silver companies in order to update this list.